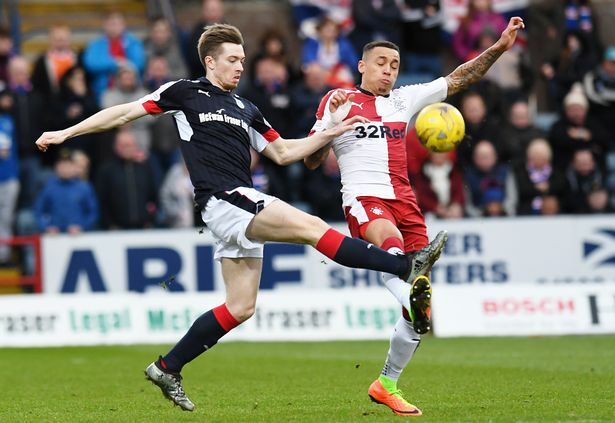 Are teams in Scotland doing enough to develop young, Scottish players? Is the problem genetics or is it targeted player development? Obviously Gordon Strachan has made headlines worldwide with his comments regarding the idea that Scottish athletes are not genetically up to par with the competition. While those comments will dominate the narrative for the foreseeable future, hopefully it helps bring a debate over player development into the discourse as well. 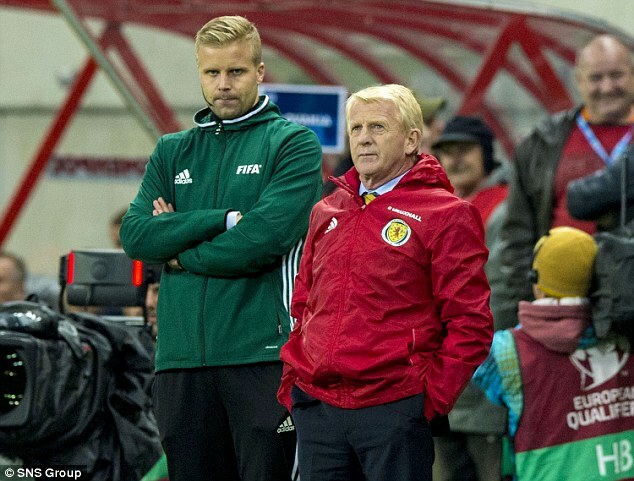 Given the dogmatic embracing of football tradition in Scotland, you have to wonder how long it will take for teams in Scotland to embrace the shift that so many other nations have made as it pertains to having ‘managers’ at the helm rather then ‘coaches’. Does the current football environment in Scotland do enough to develop young, Scottish players? Are young players getting the opportunity get key first team minutes in order to grow as footballers? I originally presented the following data on Twitter about a month ago & it lacked much meaning without context. So, after Scotland’s demise in World Cup qualifying – I was motivated to find that context. 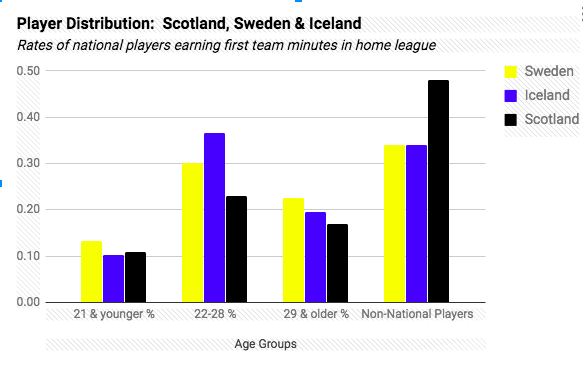 I decided to compare how teams in Scotland emphasize home-grown talent with two footballing nations who left Scotland in the international football rearview mirror: Sweden & Iceland. I went back & tallied the minutes played by three groups of players: those that were 21 & younger, those who were 22-28 (in the prime years of their careers), & players 29 or older (past their prime & unlikely to improve). For the Scottish Premiership, I used last season’s data but swapped Hibs in for Inverness given that Hibernian would be playing in the top flight this year & given their reputation for producing Scottish talent. For the Swedish data, I used stats from the Allsvenskan this season (given that they have played 26 matches) & also took the results from the current season in Iceland (22 matches). The different categories represent the percentage of total minutes in the league that are played by national players in the different age groups & then the rate of minutes played by non-national players is included to see the whole picture of how minutes are distributed. You can see that there is very little difference in the approaches when it comes to giving young players (21 or younger) first team minutes. Then you can see how the Scottish approach falls behind how coaches in Sweden & Iceland distribute minutes. Only 23% of the total minutes played last season were played by Scottish players in the primes of their careers. That’s 7% less then Sweden & 14% behind Iceland. This is where a major inquiry needs to be conducted. Why aren’t Scottish players, in the prime years of the career, getting significant first team minutes at a higher rate? Do they hit a ceiling in their development? Have they left to play elsewhere? Do managers look to give those key minutes to more veteran players? Is it genetics? their most talented players leave the domestic league) only gave about a third of the minutes to non-national players (34%). 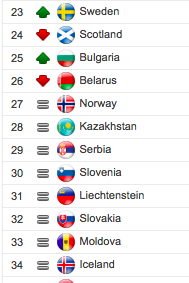 It should be noted that while the three nations are close in the UEFA coefficient rankings…. Sweden is coming off an 8-0 victory that looks to solidify their chances of going to Russia in 2018 & Iceland is on the verge of qualifying for the World Cup for the first time ever. Meanwhile, Scotland will miss its fifth straight World Cup. Of course, the data presented above piled each team into one category. Now, let’s see how the philosophies differ from club-to-club. 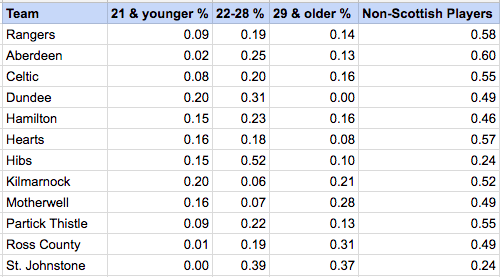 The following graph shows how each team’s emphasis on youth compares to the league average. Dundee & Kilmarnock were the most committed to playing young Scottish players last season. Dundee didn’t give a single minute to a Scottish player over 29, while Killie still relied on older Scottish players while giving very few minutes to national players in their prime. Hearts were the only team in the top six who gave more minutes to players under 21 then the league average. It’s interesting that the only team who actually didn’t play in the Premiership last season, skewed some of the overall results. Of the minutes given to Scottish players in their prime, Hibs accounted for 18% of that commitment. Besides that, only St Johnstone & to a lesser extent Dundee, fielded meaningful minutes to Scottish players in their prime in relation to the league average. Tommy Wright relied on more Scottish veteran players than any other team & it did help them reach the top six in the league table, while clubs like Dundee, Hearts, & Hibs made deliberate choices not to field many Scottish players on the wrong side of the age curve. Remember the biggest divide between Scotland & Sweden/Iceland was the reliance on non-domestically born players. Nearly half of the first team minutes in Scotland were given to foreign-born players last season. Here’s how each team compared relatively to the league average. You can see that Hibs & St Johnstone were by far the most ‘Scottish’ teams. Interestingly, if you subtract those two clubs from this study then 53% of the first team minutes were allocated to non-Scottish players. Given that….there really should be fingers pointed at nearly every top flight club in Scotland for not doing enough to develop their young talent & cultivate them into players who can thrive in the prime years of their career. Obviously, many players who begin in Scotland make the move south to England as they enter their prime. Then the question becomes what are clubs doing to the improve the players left behind? Below you’ll find an idea of organizing young players that I borrowed from Steve Dangle’s Prospect Pyramid that he designed for the Toronto Maple Leafs. From a club perspective: each team has a group of young prospects that have different ceilings to their careers. These ceilings are not fixed & can be quite fluid based on coaching, sports science, individual determination, etc. The majority of young players at a club will never develop beyond being squad players & a large number of them will never see first team minutes at the club. 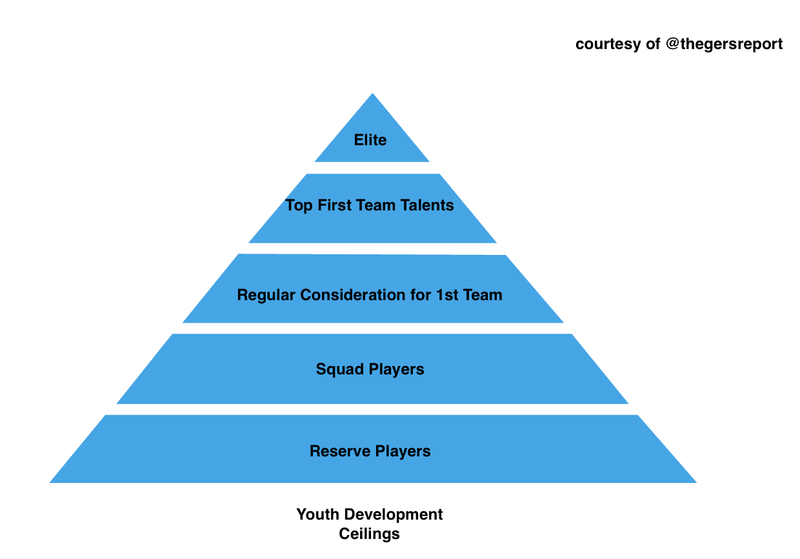 On the other end of the pyramid, elite talents in Scotland will not likely still be in the country beyond their teenage years (think Billy Gilmour). Most clubs, outside of the Old Firm, will not be able to keep their young players who are destined to be Top First Team Talents. What can teams do about that? Get them into the lineup sooner? Look for ways to tactically maximize the talents of the players below that tier? Find ways to enhance player development for those players that are not tagged as top talents? There are so many questions to be asked of both the SFA & of each & every club in the Scottish Premiership. I’ll leave you with these comments from former Rangers youth player, Steven Lennon, who now plays in Iceland’s top league.